Emily-Rose finally gets to feed the animals on her Grammy’s farm, but Emily-Rose finds that it is not as fun as she thinks it is. To ask other readers questions about Emily-Rose's Day at The Farm, please sign up. Emily-Rose's Day at the Farm by Simone Da Costa is a very delightful children's book. Little ones will love the bright colored pictures as they listen as will those old enough to read it. Emily-Rose always wants to feed the animals on her grandma's farm but is always told that the animals are too rambunctious. That is the problem.... Emily-Rose does't know what rambunctious means. On this trip to the farm Emily-Rose gets to feed the numerous animals and finds out what the word rambunctious means. Emily-Rose's Day at the Farm by Simone Da Costa is a very delightful children's book. Little ones will love the bright colored pictures as they listen as will those old enough to read it. Emily-Rose always wants to feed the animals on her grandma's farm but is always told that the animals are too rambunctious. That is the problem.... Emily-Rose does't know what rambunctious means. On this trip to the farm Emily-Rose gets to feed the numerous animals and finds out what the word rambunctious means. I was given an ARC to read and review. This had no influence on my review. I am a school librarian and can't wait for this book to be published so that I can place it in the library. She soon learns what it means, though, when she finds Emily-Rose loves to visit her Grammie and watch her feed the animals. She always looks forward to her visits on the farm., but wishes she could be the one spreading the corn and slopping the pigs. 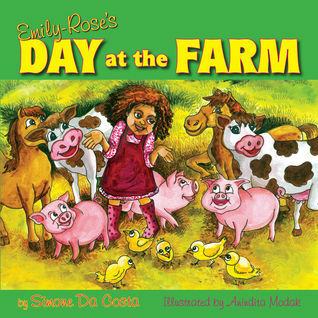 Emily-Rose’s Day At The Farm by Simone Da Costa is an adorable children’s book. It has exactly what I look for in a children’s book: humor, love and a lesson taught. Emily-Rose loves to visit Grammy at the farm and always wants to feed the animals. Grammy always so no, that the animals are too rambunctious. Emily-Rose doesn’t know what that word means, but she’s about to find out the hard way. Grammy tells her that she can finally feed all the animals and Emily-Rose is so excited. But that task i Emily-Rose’s Day At The Farm by Simone Da Costa is an adorable children’s book. It has exactly what I look for in a children’s book: humor, love and a lesson taught. Emily-Rose loves to visit Grammy at the farm and always wants to feed the animals. Grammy always so no, that the animals are too rambunctious. Emily-Rose doesn’t know what that word means, but she’s about to find out the hard way. Grammy tells her that she can finally feed all the animals and Emily-Rose is so excited. But that task is not as easy as Emily-Rose thought it would be. This book is written perfectly for a young child.. The book is just the right length, long enough for the story to unfold but not so long that a child will get bored. The words that are written are age-appropriate and will be easily understood by a child. And a new word was introduced, rambunctious, and the meaning was perfectly explained is a funny way. The illustrations were vivid, bright and colorful and helped to tell the story in a great way. I think the thing I enjoyed most about this book was that, when reading it to my grandchildren, I could use different voices while reading about all the animals Emily-Rose tries to feed at the farm. And when she was being pecked by the chickens, in a cute way, I could peck my grandchildren and make them laugh. I was able to turn this book into an interactive experience, and both my grandchildren and I thoroughly enjoyed that. I would recommend this book to anyone who enjoys reading to the children in their life. A child that is able to read will also enjoy this book. I hope that Simone Da Costa will continue to write children’s books because she does a fantastic job. "Emily-Rose's Day at the Farm" is about a young girl with an intense desire to feed the animals on her grandmother's farm. However, her repeated requests to do so meet with repeated refusals. Then one day, her grandmother surprises her by consenting. It doesn't take long for Emily-Rose to learn that feeding the animals is not as fun or easy as she thought. Author Simone da Costa, who is a multi-published writer in many genres, has written a children's story that quite literally will make you smi "Emily-Rose's Day at the Farm" is about a young girl with an intense desire to feed the animals on her grandmother's farm. However, her repeated requests to do so meet with repeated refusals. Then one day, her grandmother surprises her by consenting. It doesn't take long for Emily-Rose to learn that feeding the animals is not as fun or easy as she thought. Author Simone da Costa, who is a multi-published writer in many genres, has written a children's story that quite literally will make you smile and chuckle. Not only is it an entertaining, fun story for all ages, but also it is an experience—a full production complete with beautiful imagery, thoughtful activities, emotional appeal (I love the interaction between the three generations), topped off with subtle educational lessons taught through the introduction of vocabulary words, exposure to life on a farm, and the showcasing of animals along with their natural sounds and habits. Da Costa has packed so much into 36 pages, one wonders if she's a magician. But no, she's just a deliberate writer with a gift for storytelling. This allows her to blend all the elements of great storytelling into a package of delight. I am of the belief that one can never have too many children's books in one's personal library, whether you have children in the home or not. I am also of the belief that "Emily-Rose's Day at the Farm" should be, no, must be included in the children's section of your personal and public library. And of course, you can't have "Emily-Rose's Day at the Farm" without da Costa's other children's book, "A Silly Rhyming Alphabet Book about Animals from A to Z." No library is complete without these two books. “Emily-Rose’s Day at the Farm” is a delightful story about a little girl’s day visiting her grandmother on the farm. In her exciting adventure Emily-Rose learns from Grammy not just about the farm, but about a grandmother’s wisdom and love. Emily-Rose had always wanted to feed her grandmother’s farm animals by herself, but Grammy had forever cautioned her that they were too rambunctious. In this story, Emily-Rose gets her wish, but she soon finds out that Grammy was right -- and also exactly what “Emily-Rose’s Day at the Farm” is a delightful story about a little girl’s day visiting her grandmother on the farm. In her exciting adventure Emily-Rose learns from Grammy not just about the farm, but about a grandmother’s wisdom and love. Emily-Rose had always wanted to feed her grandmother’s farm animals by herself, but Grammy had forever cautioned her that they were too rambunctious. In this story, Emily-Rose gets her wish, but she soon finds out that Grammy was right -- and also exactly what rambunctious means! Grammy takes her to feed the chickens, the pigs, the horse, and the ducks, and then to milk the cow. Emily-Rose learns something new about each animal they visit from her grandmother’s kindly advice and explanations as she is pecked by chickens, chased by ducks, slopped by pigs and in other ways finds out just how rambunctious and unpredictable farm animals can be. Through it all is the calming, guiding wisdom of her grandmother’s loving advice and soothing words. Emily Rose's Day at the Farm is a fun children's book with bright pictures. Reading this book will help young children learn about respecting animals. A word search and match game is provided at the end of the book which reinforce the book's message. I love Emily-Rose's enthusiasm to spend time with my grandmother. I confess to being "Grandmother's baby" myself, not only because of the time I spent with my grandmother but because she raised me as well. She is confused at first when her grandmother doesn't allow he I received this in exchange for an honest review. At that time, the copy I received just contained the print and not the illustrations, so I wanted a little bit to see some of the illustrations so I could comment on both components. I love Emily-Rose's enthusiasm to spend time with my grandmother. I confess to being "Grandmother's baby" myself, not only because of the time I spent with my grandmother but because she raised me as well. She is confused at first when her grandmother doesn't allow her to tend to the animals on her own. Emily-Rose feels like she is missing out on the fun. This wonderful story teaches a number of things. One is the meaning of the word "rambunctious". Two is that Grandma knows best. Three is that when grownups say certain things, it is not necessarily to take away the element of fun but to make sure one is safe. The activities in the back of the book were a welcomed bonus. The colors of the illustrations were very rich, and I loved the detail invested in Emily-Rose's appearance, in particular, her facial expressions during the mishaps that she encountered. It will definitely keep the young reader invested while the overall story acts as a viable tool for the parent. Emily Rose's Day At The Farm is a gorgeous little book aimed at preschoolers. The story is beautifully told as Emily enjoys a precious day feeding the animals on her Grandma's Farm. Grandma keeps calling the animals "rambunctious" and by the end of the story Emily has learned the meaning of the word. I will admit that I found "rambunctious" a curious word to be drilling into such young children as I would have thought there were easier and more pressing words for them to learn, nevertheless, the Emily Rose's Day At The Farm is a gorgeous little book aimed at preschoolers. The story is beautifully told as Emily enjoys a precious day feeding the animals on her Grandma's Farm. Grandma keeps calling the animals "rambunctious" and by the end of the story Emily has learned the meaning of the word. The book is well written apart from one small error where the author accidentally slips from past into present tense. Because it was an advance review copy that I received, the author may well have rectified this issue by now, and I wouldn't normally pick up on just one error in a review, however because this book is aimed at young children then it is critical that it is error free. Can you imagine going to your Grandmother's farm and doing nothing? Emily-Rose's Grammie's farm is filled with all sorts of animals and her grandmother is always feeding them. And Emily-Rose would love to feed them when she goes to the Farm with her family in Emily-Rose's Day At The Farm, but her Grammie wouldn't allow her. Will Emily-Rose ever get to feed the animals? Da Costa is quite adept at building one's curiosity about this. When her wish is finally granted, we can feel her fear, frustrat Can you imagine going to your Grandmother's farm and doing nothing? Emily-Rose's Grammie's farm is filled with all sorts of animals and her grandmother is always feeding them. And Emily-Rose would love to feed them when she goes to the Farm with her family in Emily-Rose's Day At The Farm, but her Grammie wouldn't allow her. Will Emily-Rose ever get to feed the animals? Da Costa is quite adept at building one's curiosity about this. When her wish is finally granted, we can feel her fear, frustration, and excitement at the animals 'rambunctious' behaviour. She doesn't understand why they were so well behaved when Grammie fed them. Emily-Rose soon learns that each animal has to be fed in a different way. 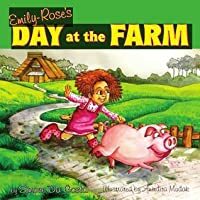 Da Costa's Emily-Rose's Day At The Farm is a delightful, and engaging story that teaches children that the world comprises different people who require different ways of interaction. I hope you will read this book as it is a lot of fun and teaches patience and understanding of animals and people. My 3-year-old was quiet until we hit the part of the story that included the animals, he I was given Emily-Rose’s Day at the Farm for exchange of an honest review. To be able to give an honest review, I decided to read the story to my two younger children… to get their opinion of this children’s book. I live on a smallholding with chickens, sheep, goats and a horse so this type of children’s book always ap Emily-Rose loves visiting her Grammie on the farm; however, she’s not allowed to help feed the animals because Grammie says that they are too rambunctious. Whenever Emily-Rose would ask her Grammy to feed the animals her Grandmother would always tell her that the animals are very 'rambunctious' a word that is very new to Emily-Rose who mistook th Emily-Rose is always excited to visit her Grammy on the farm. She always looks forward to these visits because she loves spending time with her Grandmother, and she also enjoys watching her Grandmother feed the farm animals in high hopes to one day (soon) have the responsibility of feeding them on her own. Whenever Emily-Rose would ask her Grammy to feed the animals her Grandmother would always tell her that the animals are very 'rambunctious' a word that is very new to Emily-Rose who mistook the word to mean having fun instead of it's true meaning (difficult to control, handle or wild). Emily-Rose is a delightful little girl who enjoys visiting her Grammie at the farm. She is always eager to help out but her Grammie usually doesn't let her help feed the animals because they are too rambunctious. Emily-Rose is uncertain as to the meaning of this very long word. She thinks Grammie wants to have all the fun feeding the farm animals. One day, Grammie decides to let Emily-Rose "enjoy" the experience of feeding all the farm animals. Emily-Rose soon discovers the meaning of the word r Emily-Rose is a delightful little girl who enjoys visiting her Grammie at the farm. She is always eager to help out but her Grammie usually doesn't let her help feed the animals because they are too rambunctious. Emily-Rose is uncertain as to the meaning of this very long word. She thinks Grammie wants to have all the fun feeding the farm animals. One day, Grammie decides to let Emily-Rose "enjoy" the experience of feeding all the farm animals. Emily-Rose soon discovers the meaning of the word rambunctious. She is now quite content to let Grammie have this not-so-easy task. Emily-Rose gets a trip to Grammy's farm! Grammy's farm holds many adventures, but the one Emily-Rose wants most is to feed the animals. Grammy warns her that it is not all fun & games because those animals are often rambunctious, but Emily-Rose is determined! Come along on a wonderful adventure as Emily-Rose tackles feeding the farm animals! Fun read for children who enjoy animals!! Also a great connection to family, grandparents, and the silly that comes as well. Overall I would recommend! Emily-Rose gets a trip to Grammy's farm! Grammy's farm holds many adventures, but the one Emily-Rose wants most is to feed the animals. Grammy warns her that it is not all fun & games because those animals are often rambunctious, but Emily-Rose is determined! Come along on a wonderful adventure as Emily-Rose tackles feeding the farm animals! There is an added bonus of a couple o Emily-Rose loves to visit Grammie’s farm. But this time Grammie lets her feed the animals—which she calls rambunctious. Emily-Rose will learn what that means, after a long day of feeding, getting dirty, milking, and being chased. What a wonderful children's book! I loved sharing it with my daughter who also loved it! This book was very well written and we both enjoyed everything about it. It is a good book for adults and children to share together as they can both learn something from it! It shows real life and the things that go with it and teaches at the same time! I recommend this book to anyone who enjoys reading to children or with children, it's great for any ages! What a cute little story, this little girl reminds me so much of my own. So full of bright energy and a yearning to try new things. My little one is really quite young so she was mostly interested in the illustrations, and spent most of the time pointing at pictures and flipping pages to see what came next But I am looking orward to reading this to her again and again!! I was given a copy of this book for review and found it delightful. Although the copy didn't have pictures, I was forwarded to where some would be and found them excellent, a perfect accompaniment to the story. Emily-Rose's Day at the Farm is fun read for young children. I enjoyed reading about Emily-Rose's day at the farm with my children. It was fun to watch Emily-Rose learn about the word rambunctious through the animals' actions, and it was cute when Emily-Rose realized that her Grammie is usually right and she should listen to her. Emily-Rose and her Grammie are delightful characters. I think this book will be a big hit with young children. Farms and farmyard animals are a winner with most kids and this book won't disappoint. My own grandkids can relate to Emily-Rose and how excited she is when she goes to see her Grammie and feed the animals. Even when the book is closed, the kids will continue talking about Emily-Rose and her day out! Emily-Rose's Day at The Farm is an enjoyable book for young children. The farm animals and Emily-Rose's reaction to them make the book. And like all good books this one has a lesson to teach the reader. A Cute little book about little Emily learning about farm life and what it means to rebunctious. Lots of repetitions which is good for the little ones. Emily-Rose's Grammie's farm is filled with all sorts of animals and her grandmother is always feeding them. And Emily-Rose would love to feed them when she goes to the Farm with her family in Emily-Rose's Day At The Farm, but her Grammie wouldn't allow her. The copy I received just contained the print and not the illustrations. Illustrations can make-or-break a picture book, and I was disappointed to not have them available for review. This is an I received this in exchange for an honest review. This is an interesting children's book. I enjoyed Emily-Rose's enthusiasm to spend time with her grandmother who likes to use big words that Emily-Rose doesn't understand. Emily-Rose's repetitive experience at feeding the animals on her grandmother's farm illustrates the meaning of one big word that grandmother uses to describe the animals on her farm. It wasn't clear if the message was to trust/respect your elders, grow your vocabulary, taking care of animals is hard work, or be careful of what you wish for. The end was clear that Emily-Rose learned a lesson. Emily-Rose's grandmother has a farm, but up to this day she has never been able to feed the animals herself - "Grammy" always does it. Today's visit is her chance. Grammy takes Emily-Rose around the farm, teaching her how to feed the animals. In the process, Emily-Rose learns that it isn't all fun and games, that animals aren't always what they seem, and that it is important to listen to what you are told. It's an entertaining story with a great mora I received this book as a Goodreads First Read. Simone is a writer who enjoys the compelling feeling that writing brings. In the words of Miss Da Costa ‘Writing is seen as a tool with which to free yourself in a limitless world of playful words while at the same time welcome your ideas, th Simone Da’ Costa is a writer, author, freelance magazine writer and independent publisher. She believes achieving excellence is the driving force to success.